Parathas are one of the most popular unleavened flatbreads from India. 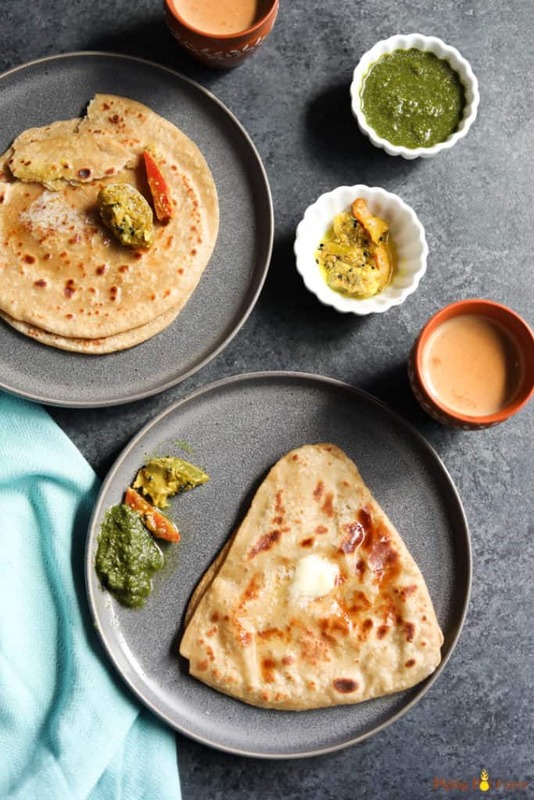 Parathas are made using whole wheat flour, by layering and rolling the dough, then cooking on the griddle with ghee or oil. 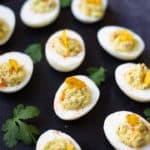 They are enjoyed with pickle and a hot cup of chai for breakfast or alongside curry and yogurt raita for lunch or dinner. Learn how to make perfect paratha’s every time! 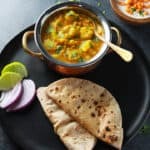 I recently shared the recipe for roti/chapati, which is one of the most popular flatbread enjoyed for lunch or dinner. If I have to say the next most popular flatbread in Indian cuisine, it would definitely be Paratha. 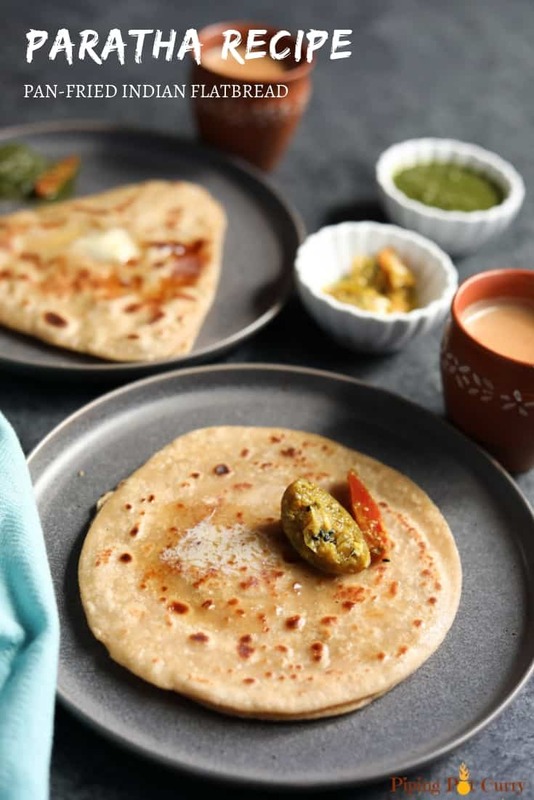 Parathas can be made plain, spiced or stuffed with veggies, paneer or even with minced meat. In this recipe I will share step-by-step how to make plain parathas in 3 shapes – round, square and triangle. When I would visit my grandparents in North India every year as a kid, the favorite breakfast would be paratha topped with lots if butter and tangy spicy anardana masala (pomegranate powder). Elders would enjoy this with chai and kids with a cup of warm milk. Some days it would be Aloo paratha, another day Gobi Paratha and yet another time Paneer Paratha. 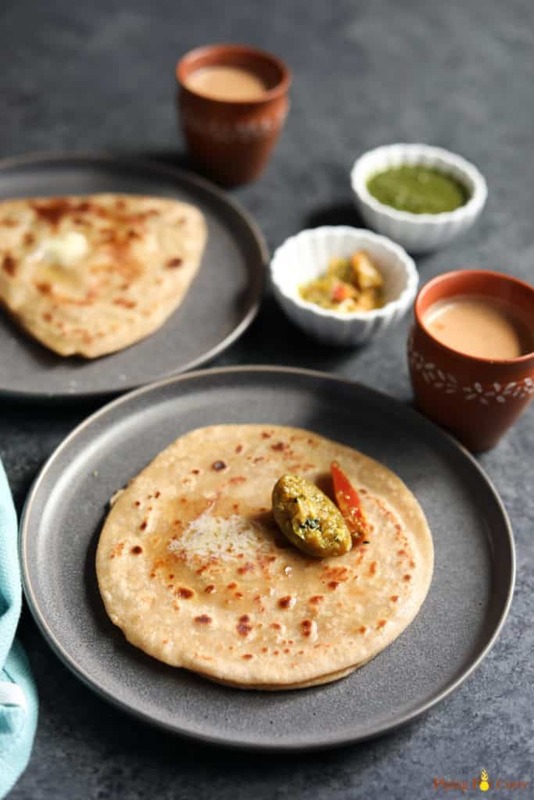 Paratha’s are also great to pack in a tiffin for lunch, especially for toddlers and kids. They keep soft for longer. I usually cut the paratha in to 8 pieces similar to a pizza for my daughter. This makes it easy for her to enjoy parathas during lunch as finger food. A paratha (parāṇṭhā) is a flatbread that originated in the Indian subcontinent. Parathas are one of the most popular unleavened flat breads in India. Plain parathas are mainly made with whole wheat flour that is kneaded using salt, oil and water. 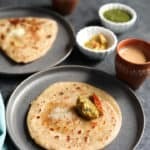 The dough is then rolled into a layered flatbread and cooked on a tawa (griddle), and finished with shallow frying with ghee or oil until there are golden brown spots on both sides. Parathas are thicker and more substantial than roti/chapati. 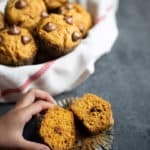 This is because they have been layered by coating with ghee or oil and folding (similar to the method used for puff pastry) or stuffing veggies or meat in with the dough. Usually the paratha is eaten with dollops of white butter or ghee on top of it. In North India or Punjabi parathas, we apply ghee or oil before layering the paratha. You could also call this ghee paratha. 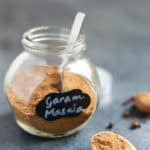 Sometimes we add some Ajwain (Carom seeds), along with the ghee, to make Ajwain paratha. Ajwain is a great addition to paratha’s as it helps with digestion and is also rich in fiber, mineral and vitamin. You can add some salt and or red chili powder (or other spices) when you apply ghee in the paratha. Depending on who you are making it for, I make the paratha with spices or just plain. For my daughter, I add lots of ghee and add salt. For myself, some ghee, salt and red chili powder. You may call this Masala Paratha. Yes, it is make with whole wheat flour, water, salt and oil. Simply replace the ghee with your favorite vegetable oil in the recipe. Which flour is best to make Paratha? After trying many whole wheat flours from Indian grocery stores, I prefer Sujata Chakki Atta or Aashirvaad Select Sharbati Atta or Aashirvaad Whole Wheat Atta. I have also tried to make whole wheat flour at home from wheat berries using a grain mill (Nutrimill), and it works great to use the flour for making paratha. It is a bit course than the store-bought flour. How to make paratha dough? In a large bowl or flat plate with high edges, take 2 cups of whole wheat flour. Add salt (optional). Slowly start adding water and mix with your hand. Do not add all water at once. Keep adding water as needed, while mixing the flour. Once the dough starts to form, do not add more water. I added a bit more than 3/4 cup of water to make the dough. Note: The amount of water will vary depending on the brand of whole wheat flour. Make the dough smooth by kneading it with your fist. Add some water to your hand and knead. 2-3 times. When you press your finger against the dough, it should leave an impression. This is the right consistency of the dough. You can apply some oil to make the dough edges less sticky. but this is not necessary. Dough should be soft. not hard (hard is best for puri’s). Same dough for paratha can be used to make roti too. Cover with a damp cloth or plastic wrap and let it rest for at least 15 mins and up to 30 mins. This helps gluten to release and the dough becomes more elastic. Open and knead once again. 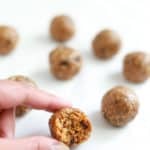 Make balls from the dough by rotating between your palms. The balls will be the size of a golf ball, sightly larger in size than roti. Make the ball a bit flat. If the dough gets too sticky, add a tablespoon of flour at a time and knead again till all the flour is absorbed. If the dough gets too hard, it means less water was added. Add a tablespoon of water at a time and knead again. The dough should be soft enough that if you press your finger against the dough, it leaves an impression. What do you need to make paratha? Marble or wood base (called chakla in Hindi). Tawa, which is a concave flat pan to make roti or paratha. You can also use a cast iron pan or any flat pan. Keep the rolling board and rolling pin ready. Keep a bowl of dry flour and a bowl of ghee to apply on the paratha. If you want to add salt, ajwain or chili powder, keep that ready. You want to roll and cook the paratha’s at the same time, so the rolled dough does not become dry. Dip a ball in dry flour, place on the marble or wooden base (chalka) and roll with the rolling pin. Roll into a circle of about 4 inches diameter. Spread some ghee (and optionally salt and ajwain) on the dough. Make a cut up to the center of the circle, using your fingers. Then start rolling on one side. Take the roll into your hand and flatten it (see picture below). Dip again in dry flour and start rolling using the rolling pin. Do not apply too much pressure while rolling. Apply equal pressure on all sides while rolling. When you roll with gentle hands, the dough flattens and moves in circles with the rolling pin. You can also turn the paratha with your hands at 90 degrees multiple times while rolling, so that it forms a circle. Apply more flour if required while rolling. This process takes practice, so be patient! Dust off the flour by flipping the paratha between both your palms to remove any extra dry flour. Spread some ghee (and optionally salt) on the dough. Bring one side of the rolled dough towards the center and press lightly. Now bring the other side on top of the folded dough and press lightly. Now fold along the other edge similar to above to make a square (see picture below). Do not apply too much pressure while rolling. Apply equal pressure on all sides while rolling. You can also turn the paratha with your hands at 90 degrees multiple times to maintain the square shape while rolling. Apply more flour if required while rolling. This process takes practice, so be patient! Spread some ghee (and optionally salt, red chili powder) on the dough. 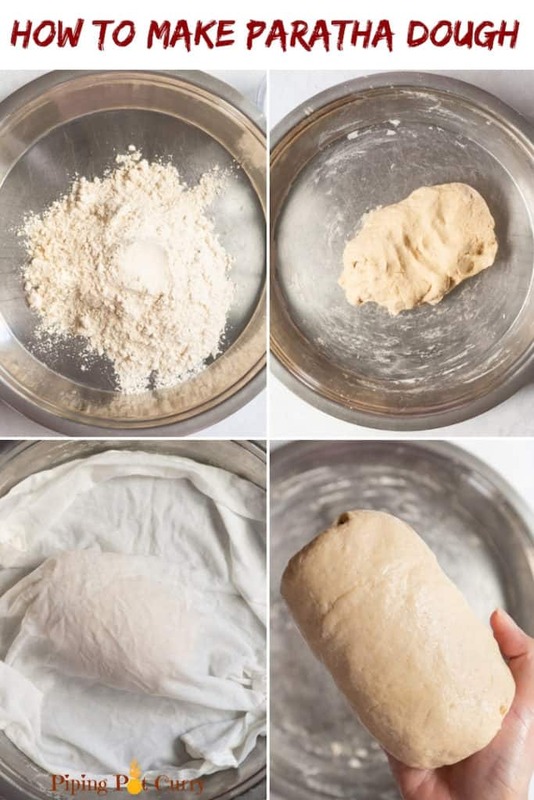 Fold the rolled dough in half to form a semi-circle. Now fold from one end of the semi-circle to other to form a triangle shape (see picture below). Do not apply too much pressure while rolling. Apply equal pressure on all sides while rolling. 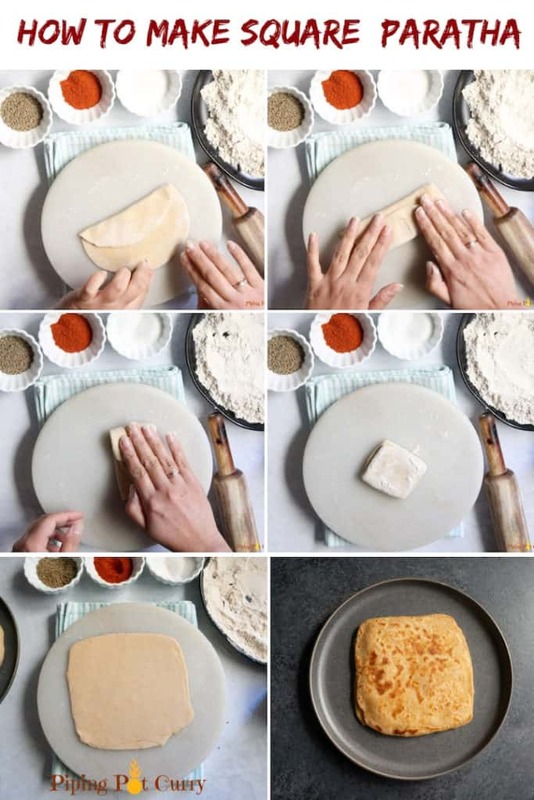 You can also turn the paratha with your hands along each edge multiple times to maintain the triangle shape while rolling. Apply more flour if required while rolling. Note: Even though I am sharing all the shapes, rolling the dough evenly to the same thickness is the most important. A uniform shape looks good, but is not required to make perfect soft and flaky parathas. How to cook soft and flaky parathas? Pre Heat a Tawa (griddle) on medium-high flame. Pick the paratha and carefully transfer to the tawa. Cook until you start seeing small air pockets and the color of the dough starts to change. With a flat spatula, flip the paratha and top with ghee just enough to make the surface of the paratha greasy (about 1/4 teaspoon). Spread the ghee evenly over the paratha with the back of the spoon. Now we want to cook until there are some brown spots on the paratha. Flip the paratha and top with ghee on the other side. Spread it evenly over the surface. Cook until there are brown spots while pressing gently with the spatula. When both sides have golden brown spots, transfer the paratha to a plate lined with a paper towel. I usually keep the paratha after cooking on a paper towel or a thin cloth in a plate. Optionally apply ghee or butter and keep stacking them. Then store in a hot casserole until serving (within a few mins or an hour). Paratha’s are best served hot! Knead the dough well, it should be not too hard and not too soft/sticky. Let the dough rest covered with a damp cloth for 15-30 minutes, so the gluten is released and it becomes more pliable. Roll the dough with soft hands, applying equal pressure on all sides. When learning to make paratha, you might need to use more dry flour. But always dust off any excess flour before cooking on the Tawa, otherwise the dry flour can make the paratha dry. As you get experienced, only apply dough once and roll the paratha. Making paratha needs lots of practice. So be patient and keep practicing. How to store Paratha and dough? Microwave: Keep on a paper towel and heat for 5-10 seconds. Stovetop Tawa: Heat each side until the paratha is soft again. Apply some ghee to make it fresher tasting. How to pack paratha for lunch in a box? Do not pack hot off the griddle paratha in a closed box. It will get soggy. Place the cooked paratha on a paper towel, apply ghee/butter. Let it cool a little (not completely). Then pack in an aluminum foil along with the paper towel. 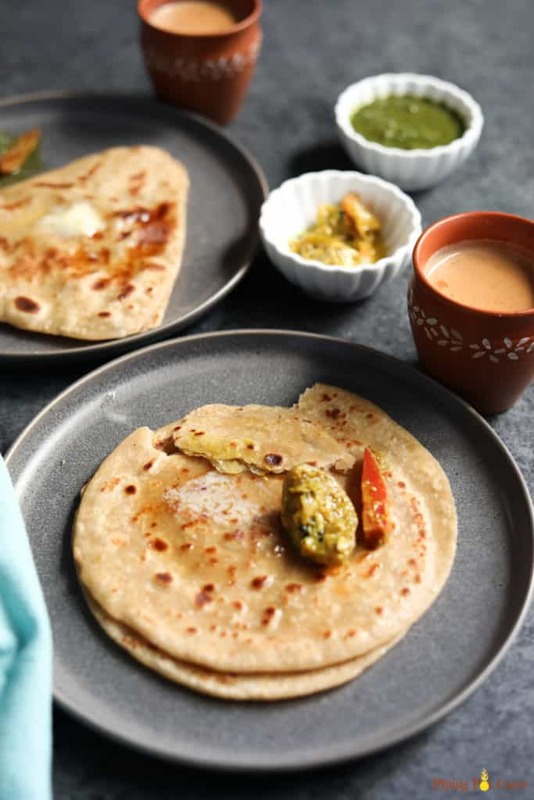 Paratha, one of the most popular unleavened flatbreads from India, is perfect to enjoy with pickle and a hot cup of chai for breakfast or alongside curry and yogurt raita for lunch or dinner. Tawa concave flat pan, or a cast iron pan. In a large bowl or flat plate with high edges, take the whole wheat flour. Add salt (optional). Slowly start adding water and mix with hand. Don’t add all water at once. Keep adding water as needed, while mixing. Once the dough starts to form, do not add more water. It takes a little more than 3/4 cup of water to make the dough. The amount of water will vary depending on the brand of whole wheat flour. Make the dough smooth by kneading it with your fist. Add some water to your hand and knead 2-3 times. When you press your finger against the dough, it should leave an impression. This is the right consistency of the dough. Cover with a damp cloth or plastic wrap and let the dough rest for at least 15 mins and up to 30 mins. This helps gluten to release and the dough becomes more elastic. Open and knead once again. Spread some ghee (and optionally salt and ajwain) on the dough. Make a cut up to the center of the circle, using your fingers. Then start rolling on one side. Take the roll into your hand and flatten it. Dip again in dry flour and start rolling using the rolling pin. Do not apply too much pressure while rolling. Apply equal pressure on all sides while rolling. When you roll with gentle hands, the dough flattens and moves in circles with the rolling pin. You can also turn the paratha with your hands at 90 degrees multiple times while rolling, so that it forms a circle. Apply more flour if required while rolling. Spread some ghee (and optionally salt) on the dough. Bring one side of the rolled dough towards the center and press lightly. Now bring the other side on top of the folded dough and press lightly. Now fold along the other edge similar to above to make a square. Dip again in dry flour and start rolling using the rolling pin. Do not apply too much pressure while rolling. Apply equal pressure on all sides while rolling. 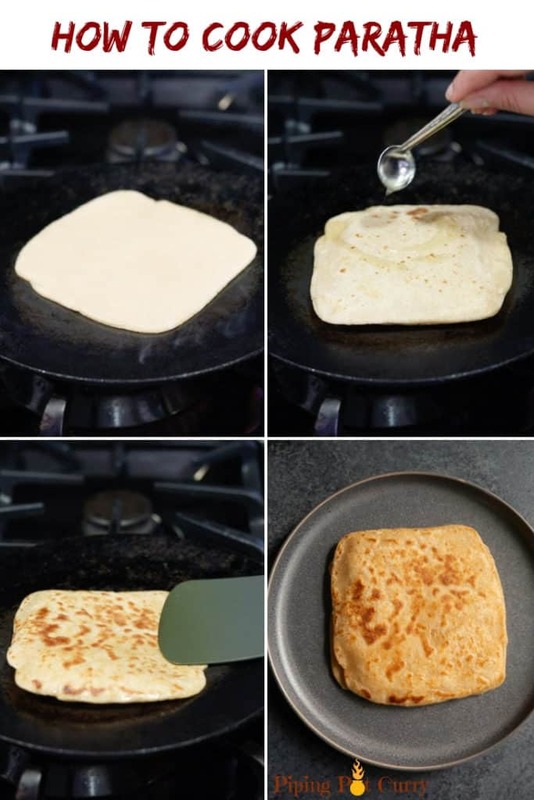 You can also turn the paratha with your hands at 90 degrees multiple times to maintain the square shape while rolling. Apply more flour if required while rolling. Spread some ghee (and optionally salt, red chili powder) on the dough. Fold the rolled dough in half to form a semi-circle. Now fold from one end of the semi-circle to other to form a triangle shape. Dip again in dry flour and start rolling using the rolling pin. Do not apply too much pressure while rolling. Apply equal pressure on all sides while rolling. 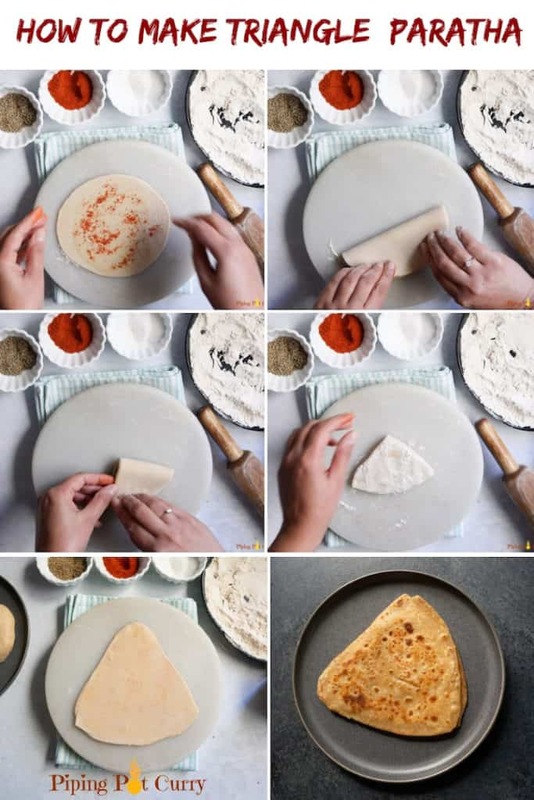 You can also turn the paratha with your hands along each edge multiple times to maintain the triangle shape while rolling. Apply more flour if required while rolling. Pre Heat a Tawa (griddle) on medium-high flame. Pick the paratha, flip between both palms to remove any extra dry flour and carefully transfer to the tawa. Cook until you start seeing small air pockets and the color of the dough starts to change. Optionally apply ghee or butter and keep stacking them. Paratha’s are best served hot! Vegan Variation: Simply replace the ghee with your favorite vegetable oil in the recipe. Best flour for paratha: I prefer Sujata Chakki Atta or Aashirvaad Select Sharbati Atta or Aashirvaad Whole Wheat Atta.